Lyme cases are down through the month of July compared to the same period last year, and experts suspect it's because ticks that carry the disease are lying low. The number of Lyme disease cases has declined so far this summer from last year, and experts say the recent hot and dry weather may be responsible, by causing the ticks that carry the disease to go into a dormant, hibernation-like state. A September 2010 photo of a female deer tick. Surveys this summer in Maine, New Hampshire and Massachusetts are turning up fewer deer ticks, but it doesn’t mean they have died. Charles Lubelczyk, field biologist at the Maine Medical Center Research Institute in Scarborough, said preliminary results from deer tick surveys in Maine, New Hampshire and Massachusetts this summer are turning up fewer ticks. It doesn’t mean they’ve died – most likely the arachnids have burrowed under leaves or in the dirt. 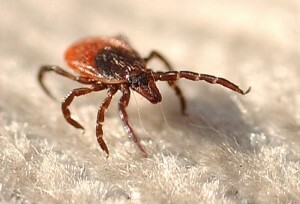 Lubelczyk said the reduced tick activity likely correlates with lower numbers of Lyme disease cases this summer, although that connection hasn’t been proved. Lyme disease cases are down so far this year when compared to last year and are well below five-year averages, according to the Maine Center for Disease Control and Prevention. Through July 31, Maine had 443 cases of Lyme disease, 100 fewer than at the same time last year. In most recent years, Maine had 500 to 650 Lyme cases through July, except for 2016 – which was another dry summer – when 469 cases were reported. Lyme cases in Maine hit an all-time high in 2017 with 1,787 cases, and Lyme disease has set records every year since 2011, except for 2015. The disease is one of the most significant public health threats in Maine. Lyme can cause flu-like symptoms, rashes, swelling, fatigue and neurological problems, such as Bell’s palsy. Some people get a bull’s-eye rash near where they were bitten by a tick. People who may have been exposed to ticks – such as while stacking firewood or walking through brush – should do “tick checks” to make sure none have attached. Preventive measures include wearing long clothing, putting on bug spray and keeping your property clear of leaves. If caught early, Lyme can be cleared up with antibiotics. However, if left untreated, Lyme disease can spread to joints, the heart and the nervous system, and similar long-term health issues can linger for years in post-Lyme disease syndrome, according to the U.S. Centers for Disease Control and Prevention. Despite an easing of Lyme cases this summer, experts caution that a wet fall would bring the ticks back in droves. 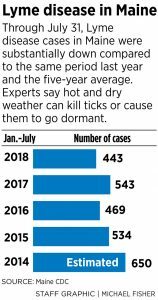 In 2016, drought-like conditions in the summer led to lower levels of Lyme disease through the end of August, but the state nevertheless set a then-record for Lyme disease when a rainy fall reactivated the ticks, ending the year with 1,464 cases. Deer ticks thrive in wet, damp conditions that aren’t too hot or too cold. Extreme cold can kill ticks, but snow acts as an insulator, so ticks can survive subzero temperatures if there’s snow on the ground, according to research by the Maine Medical Center Research Institute and the state of Connecticut. Research is also ongoing about how climate change is potentially expanding the deer tick’s range to more northern areas of Maine. Griffin Dill, integrated pest management professional at the University of Maine Cooperative Extension, said ticks are hardy and difficult to kill, even if they don’t do well in hot and dry weather. Lubelczyk said the rain that Maine has had this summer has tended to be passing showers or storms, rather than days of extended rain. Ticks fare better when it rains days in a row, soaking the ground, he said. According to the National Weather Service in Gray, Maine has experienced moderate drought along the coast this summer, from Portland to Down East, with abnormally dry conditions inland and in northern Aroostook County, but with normal rain conditions in sparsely populated areas of the state, such as in Piscataquis County and most of Somerset County. Ticks are more prevalent in coastal areas – where conditions are generally damper – so the fact that it’s been much drier than usual along the coast correlates with reduced Lyme disease cases, Lubelczyk said. William Watson, a meteorologist with the weather service in Gray, said that while rainfall has been below average, summer temperatures in Portland were much higher in July and August than a typical summer. The average high temperature in July was 2 degrees Fahrenheit above normal, and August highs were 3 degrees higher than average. The average high in Portland in July is typically 79 degrees, and 78 degrees in August. The average temperature in August, factoring in daily lows and highs, set an all-time record in Portland this year, at 72.2 degrees. Maine has also experienced high numbers of anaplasmosis cases, another disease similar to Lyme caused by the deer tick. In 2017, Maine had a record 662 cases of anaplasmosis, and cases so far in 2018 – 309 through July – are tracking similar to last year.